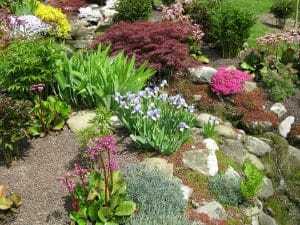 Eye-catching, imperious, tasteful: rock gardens can transform your environment from bland to brilliant. Malleable enough to suit any taste or theme, a well-designed garden could be the missing ingredient required to build your own personal oasis. There is truly huge diversity in garden designs. Earthy and rugged bridges built over water features offer unparalleled personality to an outdoor living space, whilst rock gardens which make pragmatic use of gravel, tinted concrete, and rock walls will ensure you have a functional and interesting garden without having to contend with nature. For those who feel the cold in their bones in winter, a rock based fire pit provides a unique and cultured function for a garden in those wrap-up-tight months. We also specialise in the Japanese rock garden. Also known as the ‘zen’ garden, the Japanese rock garden is well known for its unique, relaxing, and aesthetic imagery. Thegarden is a perfect choice should you wish to create three-dimensional artwork in your backyard or business space. Popular for environments that look to promote an Eastern approach to spirituality and culture, the Japanese rock garden creates a vibe unlike any other through the medium of carefully placed rocks used to symbolise mountains, along with sparse plants, water features, moss, pruned trees, gravel, sand, and bushes. Why Choose Everlast Services for Rock Gardens? As a proud Australian company, Everlast Services is committed to providing a truly exceptional standard of workmanship and materials. We’re uniquely placed in the Victorian marketplace because we manufacture our own materials at our state-of-the-art manufacturing factory in Hoppers Crossing, Melbourne. In choosing Everlast Services, you’re not only guaranteed the finest quality workmanship and material, but you’re also supporting local Australian manufacturing. We have a simple mission here at Everlast: to offer best-in-class service and products at an affordable price. You might be wondering how we can offer such a pricing game-changer in today’s competitive market. Well we’re proud of the answer. Our 20 years’ worth of experience in landscape design, contracting, and project management means that we know our trade inside and out. But more than this, we’re privileged to be able to manufacture our own materials, which means that our savings are your savings.